Recently, during one of my lectures on the powers of the mind in a business school, someone from the audience, a young man from Denmark, asked me: “What are the limits of the powers of the mind?” I took a moment before answering and then said, “None.” And then, to support my statement, I quoted the Yoga Vasishtha, that voluminous Indian classic on the human mind, believed to be written by the sage-poet Valmiki in an era when much of the world was not yet civilized. Indeed, there are no limits to the powers of the mind. My lecture was more specifically focused on the power of belief and how belief alters our biology itself. Speaking of the power of the mind to alter biology, Dr. Herbert Benson, MD, for instance, quotes in his celebrated book Timeless Healing Dr. Stewart Wolf’s 1950 study of women who experienced persistent nausea and vomiting during pregnancy. “These patients,” says Dr. Benson, “swallowed small, balloon-tipped tubes that, once positioned in their stomachs, allowed researchers to record the contractions associated with waves of nausea and vomiting. Then the women were given a drug they were told would cure the problem. In fact, they were given the opposite – syrup of ipecac – a substance that causes vomiting. One of my favourite examples for this is fire-walking – particularly the case of fire-walking by Chittiravel, a Tamil-speaking Sri Lankan. It was on 4th July, 1991, while the U.S. was celebrating Independence Day, that Chittiravel was arrested as a suspected LTTE supporter in his hometown and taken away by the Sri Lankan police. When he was first taken to the camp, he was forced to enter a large water tank, in which he was questioned and repeatedly dunked under water throughout the night. Finally he was stabbed in the thigh and removed from the tank. Then his torturers packed the large knife wound with salt and chilli powder and tied his thigh tightly. He was hung from a beam during continuing interrogation while his torturers burned the skin of his legs in many places with cigarettes. They had been drinking and repeatedly demanded, ‘You tell the names of the Tigers.’ Later, while his legs and arms were chained, one of the men knocked out four upper front teeth with a single blow of his fist. He also sustained a large wound on the left side of his skull. Chittiravel’s woes do not end here, but only begin with these. His “thumbs were then tied together behind his back and he was hoisted high off the floor, hanging from the rafters. While suspended, he was severely beaten with a large akappai [a wooden utensil for stirring large pots of rice]. As the beatings continued for a long time, the rope frayed and he fell to the floor. Years ago, like many other devotees of Veeramma Kali [Mother Kali in the heroic form], the presiding deity of his hometown, he had taken a vow to walk on burning coals every year, fire-walk being a fairly common vow that devotees of the Mother Goddess took wherever Tamil people are to be found. He had done it several years successively before his arrest. However, the bilateral fractures of both hips he had suffered as a result of the tortures in the detention camps had resulted in a permanently frozen pelvic girdle, crippling him for life. Chittiravel could not walk now – he could only move sideways, stretching out one leg at a time, and that too with great pain and discomfort. But this did not stop him from keeping up with his vow and performing a feat the very thought of which scares most of us. 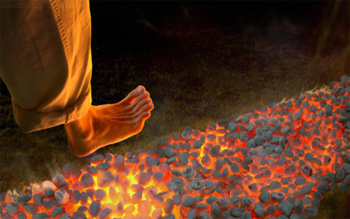 Remember when we are talking of fire-walking, we are not talking of a man quickly running over a tiny bed of dying or dead embers, his feet and legs wet, actually stepping over the coals once or twice – though even this is not something most of us would dare to do. Fire-walkers actually walk at normal speed through a long bed of burning embers to fulfil their vows. The fire-bed on which they walk barefoot is often more than five meters long, more than a metre wide and a full metre deep, as in the famous Uduppawa fire-walking festival. The embers are prepared from tamarind wood, which burns slowly, producing fierce heat. A huge amount of tamarind wood is cut down and gathered in advance, and for hours fire builders heave logs into the massive fire built up, making flames leap to the skies. By evening even approaching the fire-bed becomes a daunting task, so hot is the whole place where the massive bonfire has been burning for hours. The bed of embers is, of course, pure fire, pulsing red, looking like a crouching vengeful fire dragon, as someone put it. Each piece of coal in the metre-thick bed of live coals is the size of a large potato. The bed smoulders furiously, every now and then sending up sparks and flames leaping out. It is over this that people serenely walk, to the accompaniment of fiercely beaten drums and loud, intoxicated chanting of mantras. The walker often balances a ritually sanctified pot on his head. Like hundreds of other men, women and children, Chittiravel continues to walk over this scorching trench every year, to keep his vow to Veeramma Kali. The deformed man, bent from the waist, his legs not fully in his control, steps onto the fire with one foot, pulls his other leg near the first one, then stretches out the first leg as far as it would go sideways, pulls up the second leg near it, moves again the first leg, thus slowly moving across the entire length of the five meter-long, one metre-thick inferno as the entire population of his village shouts the name of the goddess in intoxicated ecstasy. Chittiravel, like other firewalkers in his village, emerges from his fire-walking completely unscathed by the fire. He believes Mother Kali guards him through the firewalk and he is guarded. What we find here is the amazing power of belief and the miraculous things the human will can achieve. A man from the western world who demonstrated repeatedly the amazing power of the human will is Wolf Messing. His life exemplifies the power of the human will as few other modern examples do. Wolf Messing had for the first time in his young life realized the enormous powers of his mind. He sought work in Berlin and found one. But so poor was the pay he received that he did not have enough to eat. Once he fainted from hunger and was taken to a morgue, since people thought he was dead. Here however, his future benefactor and teacher found him – Professor Abel, who was both a psychologist and a neurologist. Professor Abel rescued him from the morgue and then, realizing the special powers the boy had, began training him. Professor Abel realized the boy had unbelievable control over his body. He could become cataleptic at will, for instance, and enter a trancelike state. In this trancelike state, Messing could receive mental commands from the professor and execute them precisely. If Messing could read his mind in his trance, deduced Abel, then he should be able to read other people’s minds too. The professor sent him out to the market and asked him to read the minds of the vendors there. And Messing was a complete success in this. Messing also learned to turn off feelings of physical pain and gave displays of this in order to make money for himself and for his family in Poland. He now began his tour across Germany, displaying his many remarkable powers to earn a livelihood. During his exhibitions, Messing asked members of the audience to give him mental orders to do things and he did these. He could also tell total strangers details of their past and also find things the audience had hidden. Wolf Messing was now sixteen years old. Hearing of the boy’s powers, Albert Einstein invited him to his home. On that visit, he met another celebrity there: Sigmund Freud, the greatest psychologist of the twentieth century. To prove Wolf Messing’s powers to receive mental orders, Freud ordered the boy to go get a pair of tweezers and with them, pull out three whiskers from Einstein’s celebrated moustache. The young man was a little embarrassed at the playfully irreverent command, but executed it all the same. The Soviet Dictator Stalin now learnt of Messing, and he was taken to the leader. Stalin set up a test to prove Messing’s will power. The young man should go to a bank, hand over a blank piece of paper to the clerk at the counter and ask for ten thousand roubles. If the clerk took the blank paper for a check for ten thousand roubles and gave him the money that would prove Messing’s power to influence others through his will. Stalin was impressed, but not convinced yet. He set up another test. This time what Messing had to do was break Stalin’s own heavy security and enter his office. He left instructions to his guards to be on the alert – Messing might try to fool them. The guards were on the alert, but a few minutes later Messing stood before Stalin in his office. Asked how he managed the feat, Messing told the Soviet dictator that he had sent out a powerful thought all around: that he was Lavrenti Beria, the feared head of Soviet secret police. When he entered Stalin’s place, it was Beria that the guards saw entering and not Messing. They saluted the police chief and stood at attention, allowing him to go into Stalin’s office. Before allowing himself to be fully convinced, the dictator wanted him to do a third thing: leave the Kremlin without a pass, something impossible. Messing got up and walked out of Stalin’s room without a word, and a secretary followed him, to keep an eye on him. In a few minutes Messing was waving to Stalin from the streets. Questioned, the guards swore that it was Stalin himself who had walked out of the building, followed by a secretary! We must remember that these proofs were given in communist Russia which philosophically could not accept that a thought could exist outside the human brain because Marxism-Leninism did not support such ideas. What he was doing was against communist ideologies and their materialistic beliefs. The Institute of Philosophy of the Soviet Academy of Sciences, for instance, refused to accept Messing’s powers for what they were – psychic powers – and sought materialistic explanations for them. They made public announcements that Messing’s powers were based on his power of observation – he could just read the thoughts of others from their involuntary muscle movements. To them, telepathy did not exist. And yet they failed every time in stopping Messing from succeeding in what he did. Messing was a Jew now working with the Soviet Union and Hitler had declared him an enemy of the state and put a reward of 200,000 Reichsmarks on him. There were pamphlets everywhere with his photographs and the promise of the reward. And it so happened that one day Messing wandered carelessly into Nazi-occupied Warsaw. He was caught and taken into custody and beaten mercilessly. When the guards went away, he decided to use his mind powers to save himself – the other options were either death or joining Hitler. Wolf Messing willed the guards to open his cell and to come to him. They walked into the cell in a trancelike state. Messing locked them in the cell and escaped. In an adventure that reminds us of the hunchback Quasimodo of Victor Hugo, he left Warsaw walking through the sewers. Later he travelled hiding in a hay cart and eventually reached the Soviet Union travelling only at night and hiding during the days. In India we have known this amazing power of the mind for ages, and we called this iccha-shakti, literally, will power. We had not only known this power, but developed a scientific method to cultivate it. This method is known as tapas and tapas is one of the foundations of Indian culture. We find tapas mentioned throughout ancient Indian literature, be it the Vedas, the Upanishads, the Epics, the Puranas or any other branch of ancient Indian literature. One of the most beautiful descriptions ever of tapas is found in Kalidasa’s Kumarasambhava where he thrillingly describes Uma’s fierce tapas to win Shiva as her husband after her beauty failed to win him over. Eventually Shiva appears before her in a scene that Kalidasa describes in rapturous poetry of unsurpassed beauty, and the timeless lovers are united once again for all eternity. The Mahabharata mentions Krishna performing tapas for twelve years in the Himalayas. All our ancient sages are great tapasvins – practitioners of tapas – and had developed enormous powers through it. Such was their power cultivated through tapas that what they willed, and what they uttered, happened, good or bad. Thus we have the story of the sage Vasishtha – to quote just one from maybe ten thousand such stories – cursing the arrogant Ikshwaku king Kalmashapada and changing him into a rakshasa surviving on human flesh. Helplessly Kalmashapada becomes a rakshasa while still retaining his memory and falls into a life he hates. When Kalmashapada loses his arrogance and apologises, the sage converts him back into the noble king he was. There are innumerable stories of the impossible becoming possible under the blessing of a sage. In fact, the power of a tapasvin to bless and curse is a living belief in India even today. Such was the power acquired through tapas by Sage Vishwamitra that he created an alternate universe from his mind. Even if we do not go to such extremes, will power is something everyone of needs and can easily cultivate by taking simple decisions and then sticking to them in spite of difficulties. A simple once a month or once a fortnight fasting is an example for an exercise meant to cultivate will power. While ascetics in ancient India practiced their own numerous forms of tapas – Uma’s tapas involved such extreme steps as living only on leaves that had fallen from trees, standing in neck-deep water in winter, and remaining seated beneath the burning sun, surrounded by fires on all four sides – grishastas, family men and women, had their own forms of tapas. One of the most famous of such forms of tapas is the chandrayana vrata, in which one ate a full meal on the full moon day, reduced it by one-fifteenth the next day, by two-fifteenth the next day, and so on, until one reached a full fast on the new moon day. Asidhara vrata was a form of tapas based on sexual control. In its simplest form, a young man and a young woman slept with a sharp sword placed between them. In our world today, driven by market forces and advertising, where men and women are easy prey to so many temptations, an exercise that develops will power through some simple form of tapas could be of immense value to everyone. And of course, for those who want to go on the exploration of the inner world, the greatest adventure man has ever undertaken, tapas offers an exciting challenge.